It can be deployed both as a traditional desktop application and as a command-line application distributed onto large computing servers. FieldAlign V3.0 also introduces native support for the Mac for the first time. 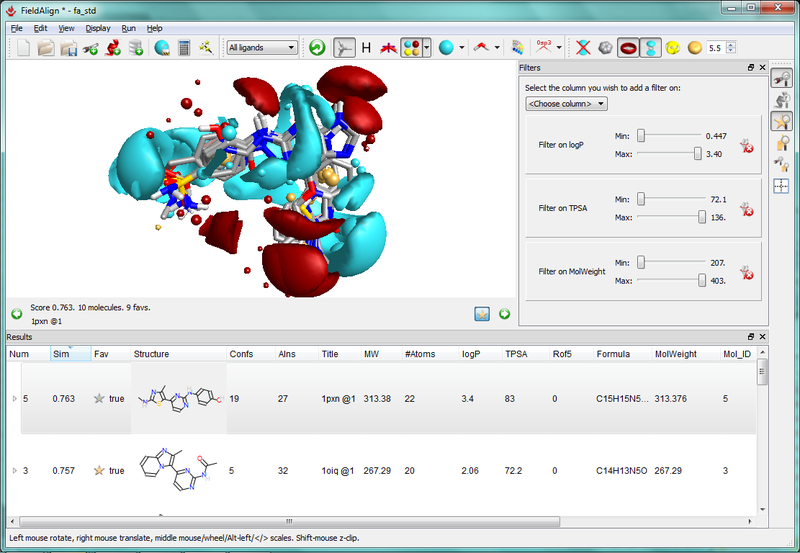 FieldAlign is a powerful molecular design and 3D Structure Activity Relationship (SAR) tool which generates biologically relevant molecular comparisons, which can be used to find the root causes of activity or inactivity. FieldAlign helps chemists to gain detailed understanding of the SAR of their lead molecules and to use this to design the best next synthesis. FieldAlign V3.0 introduces a range of user features that improve productivity and customisability. Its command line interface supports scripting and workflow systems, and is now available on Windows, Linux and Mac platforms. The incorporation of a new molecule table enabling filtering and sorting of lead molecules, using imported data or standard physical properties, such as wcLogP, TPSA, Rule of Five violations. The new molecule editor enables rapid design iterations, while the multi-processor support facilitates faster run times on modern computers. With the option to expand computational power by distributing remote FieldEngines and its enhanced integration with other chemistry applications, more flexible licensing options provide advanced user flexibility. “FieldAlign V3.0 is now much simpler to deploy throughout a company and easier to use. This gives medicinal chemists access to an intuitive and powerful tool that enables them to accurately evaluate the effect of small design changes before synthesis”, said Tim Cheeseright, Products Director at Cresset.